After my excellent visit to Lake Placid at the end of August, I wanted to share the experience with my family. It was another high pressure day, with low winds and clear skies forecast. While the winds were indeed calm, the clouds did not burn off in northeastern NY as forecast. We had a great trip nevertheless. Headed eastbound at 3500', the air was incredibly clear. Some low clouds at our altitude still hovered over Lake Ontario, reflected on the lake's strikingly calm surface. 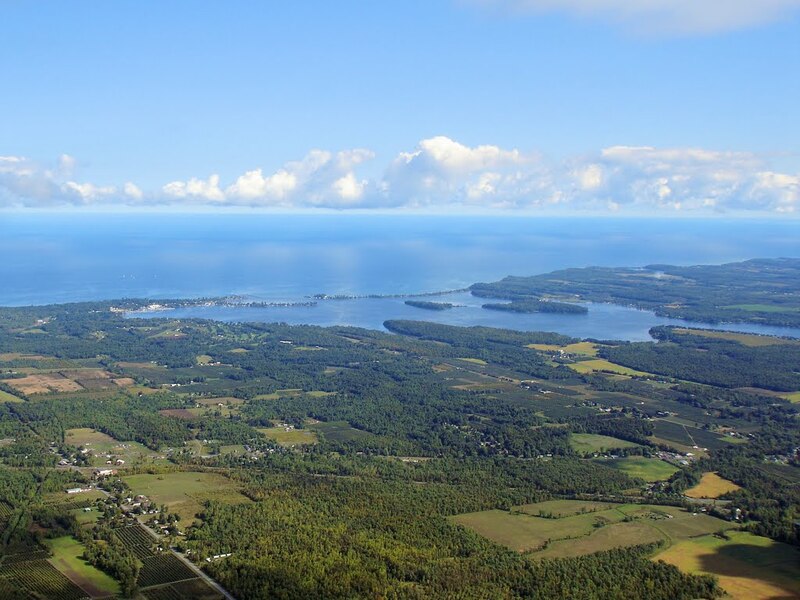 Sodus Bay, pictured here, is one of the more definitive landmarks of any flight along the lake. Near Syracuse, the cloud cover thickened, leading us to climb to 9500' to clear it. From 9500', we could maintain visual contact with the ground through massive holes in the scattered layer. In this case, we were struck by the sight below - dozens of wind turbines dotting the landscape. While still above the scattered layer, Kristy and The Bear managed a new first: a high altitude diaper change! 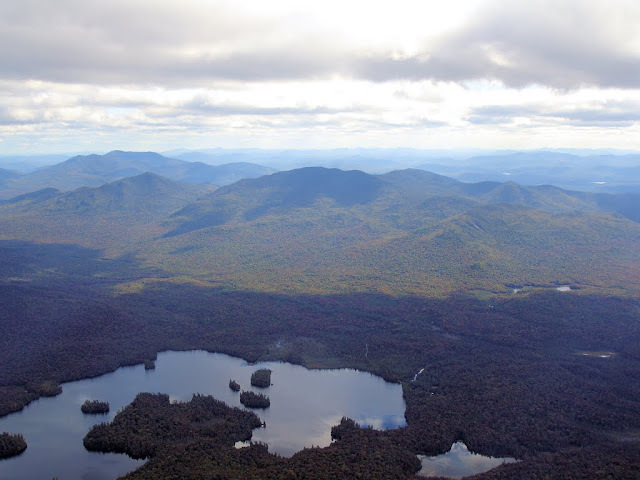 Closer to Lake Placid, we found ourselves bathed in sunbeams beneath a scattered cloud layer. The rising terrain of the Adirondacks blushed with the slightest hint of autumn ruddiness. 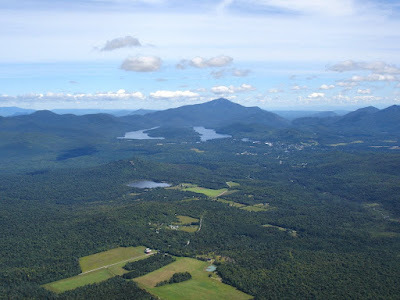 On approach into Lake Placid, Kristy caught this photo from the back seat. It's the same bit of contour farming that grabbed my attention on the last visit, caught under a hole in the scattered layer as though a spotlight were deliberately focused upon it. 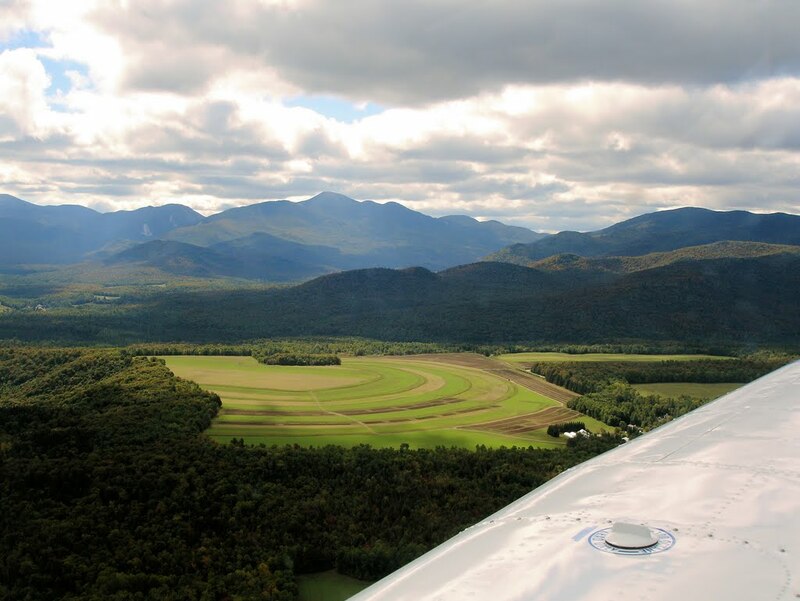 Kristy's perspective of our base to final turn for runway 32 at Lake Placid. Even before exiting the taxiway, the Unicom operator asked us if they should call the Trolley to take us into town. I barely had the Warrior's wheels chocked before the Trolley appeared in the parking lot. Now, THAT'S what I call service! We had lunch on the edge of Mirror Lake. Though it was a chilly day, we sat outside on the deck next to a powerful stove pumping out the heat. 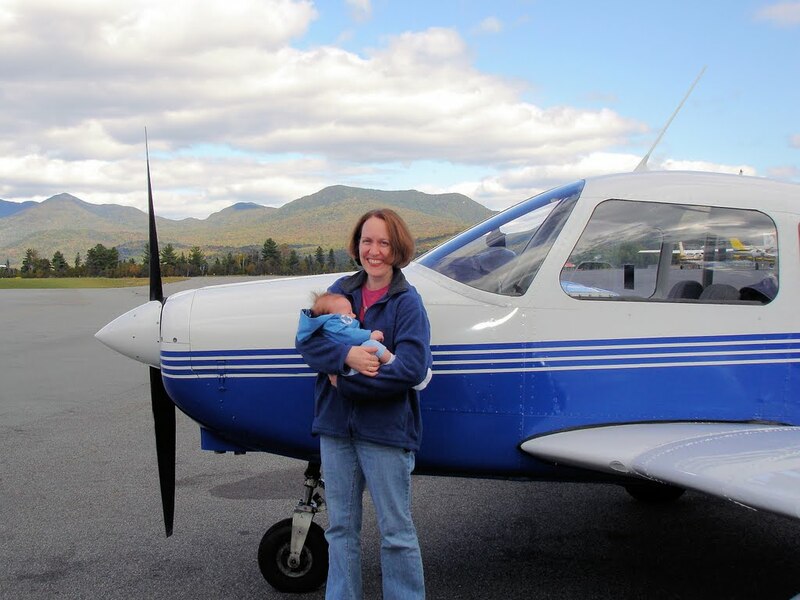 Kristy and The Bear at the Lake Placid airport, preparing to depart for the flatlands. 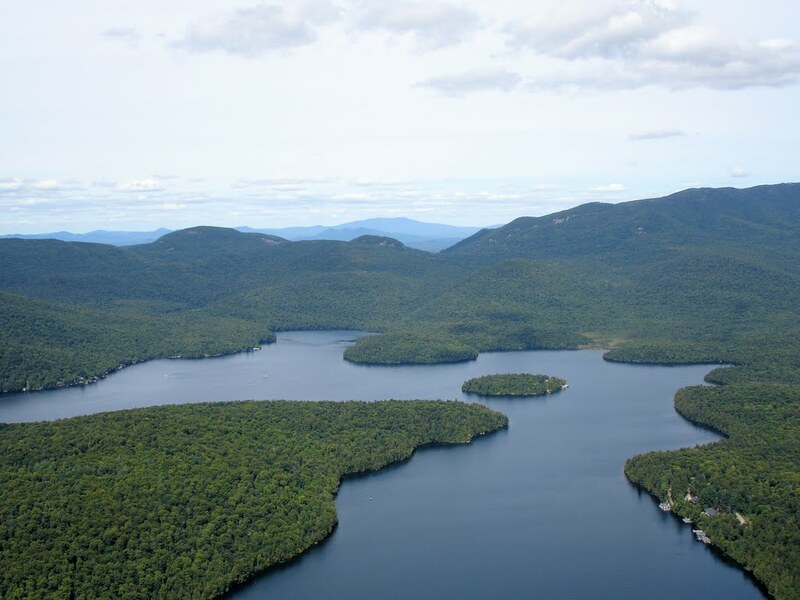 Lake Placid is a great little town. Kristy captured this snapshot of town as we climbed away from the airport on our return flight. We had an excellent lunch and wandered the shops. As new parents, we were particularly taken with a shop that sold nothing but novelty Onesies for infants. Offerings included one that read "nobody puts Baby in the corner" (if Dirty Dancing had any real value, it's that nearly 20 years later, it's pretty darn mockable) and another olive drab Onesie depicting the silhouette of Che Guevara. 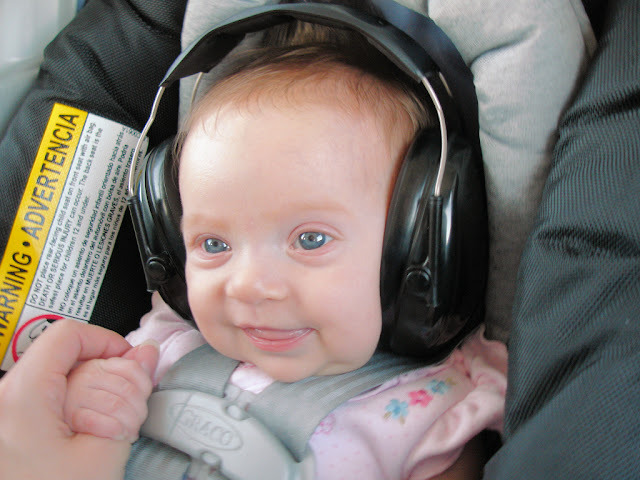 My infant daughter's brilliant blue eyes fixed on the sky outside the Piper's window, twinkling from between the slightly oversized hearing protectors bracketing her head like a padded c-clamp. I wondered what she found so compelling outside that window and what sense, if any, the view made to her. The journey itself was nothing new, if not quite routine; traversing the sliver of foreign airspace interposed between Buffalo and Detroit. We had made this trip before. 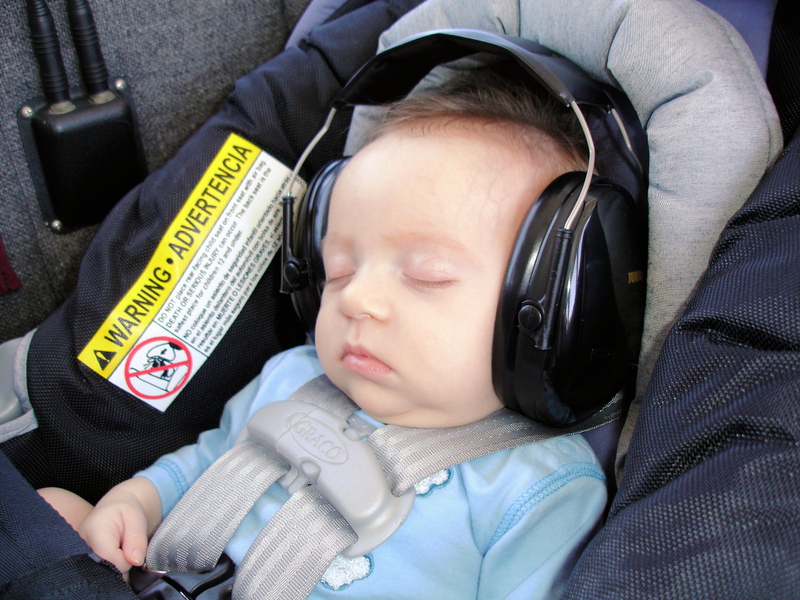 But this was the first time with our two month old daughter aboard, gazing out the window or snoozing in her car seat as though flying a mile above the countryside was the most ordinary thing in the world for an infant to do. Our daughter, affectionately known as The Bear (as in, "don't poke the..."), took her first trip aloft at the tender age of five weeks. It was a simple test to see if the sound and fury of our single engine Piper Warrior would induce a fit of screaming. We belted her car seat to the rear seat of the Warrior and, with Kristy sitting alongside, made a trip around the pattern. The momentous occasion lasted a handful of minutes and ended with our daughter falling asleep on short final. The result, however anticlimactic, was exactly what we had hoped for. Next came the altitude test. How would she -- and perhaps more importantly, her ears -- handle ascents and descents? Once again, with Kristy and baby sitting together in the back, we slipped the surly bonds and climbed to 5500'. Lulled by the white noise and vibration of powered flight, our daughter fell asleep before ever climbing out of ground effect. This was a good thing as it meant she did not object when Kristy adorned her with the hearing protectors that scrunched her face up a bit but nevertheless covered her ears. Up to 5500' and back down at no more than 500 feet per minute. For the descent, we woke our daughter so that she could indulge in a bottle as a way to balance the pressure in her ears. 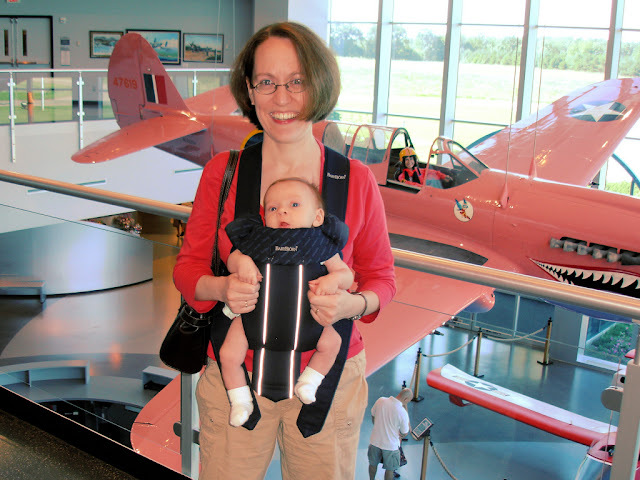 Back on the ground, we were the proud parents of a grinning baby aviatrix and knew that she most certainly had "the right stuff". Friday: "Shuffle Off to Buffalo"
We had meant to visit our adoptive home of Kalamazoo, MI before our daughter was born but never made it. With summer drawing to a close, we decided to make the trip with baby in tow. 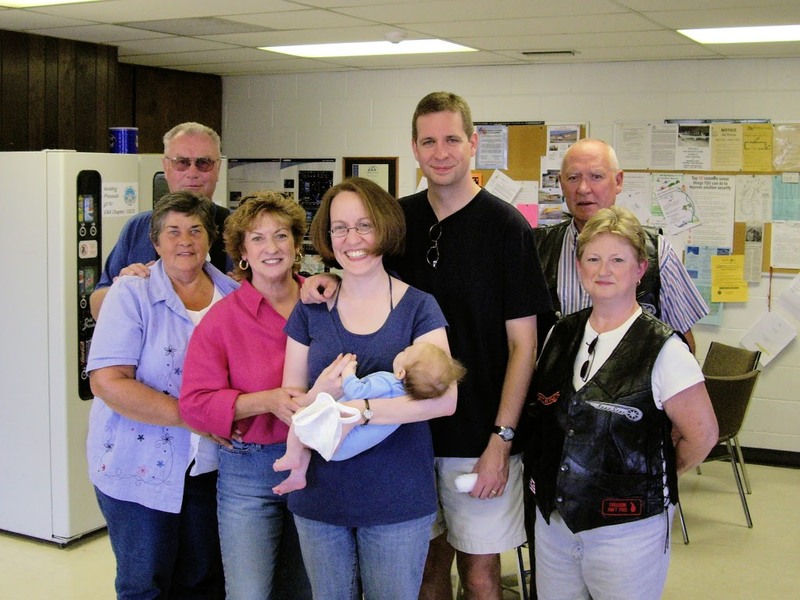 As we planned the trip, we included a stop in Lapeer, MI to visit with relatives. The flight from Le Roy, NY to Lapeer, MI would require about two hours, providing us with a nice break en route before finishing the final hour to Kalamazoo. The ground track flown by The Bear on her first cross country flight. Canadian overflights are relatively straightforward, provided that some minimal criteria are met. In short, border crossings must be made while on an active flight plan, squawking a discrete transponder code, and engaged in two way communication with air traffic control. Should we be unable to meet these criteria, our backup plan was to divert south of Lake Erie and effectively fly the long way around. Unfortunately, I viewed this backup plan as a necessity as I had concerns about our ability to meet these simple criteria. Since the aggressive consolidation of flight service stations in early 2007 by Lockheed Martin, the aviation media was rife with complaints about the new system. The litany of issues focused on long telephone hold times, briefings given by flight service personnel with no local knowledge of the planned route, and most worrisome, flight plans lost in the system. On August 31, at 1700 universal time, the three of us were still climbing away from the Le Roy airport when I called Buffalo Radio to open our flight plan. "Buffalo Radio" was actually a misnomer - the Buffalo Flight Service Station had been closed months before. The sectional still read "Buffalo", but the call was actually relayed to some other geographic location. Regardless, Flight Service answered the call and activated our flight plan to Lapeer. 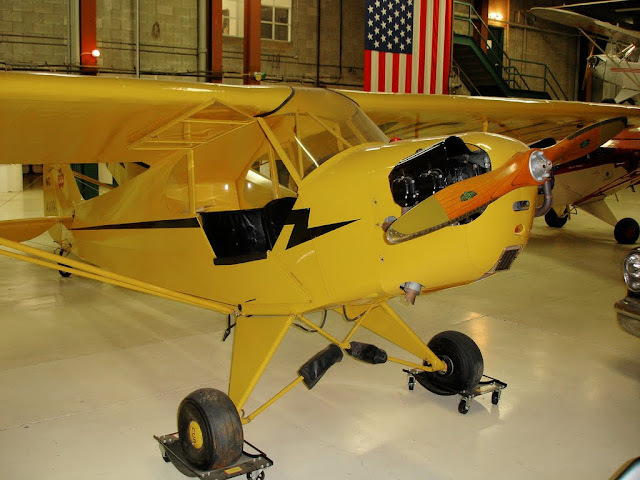 No lost flight plan meant no circuitous trip around Lake Erie. And I relaxed for a moment. Then I tuned into Buffalo Approach on 126.15. It is not unusual to change frequencies and arrive in the middle of a transmission between air traffic control and one of the many distant specks buzzing around an airport like Buffalo. We were 12 miles east of Buffalo at 6500 feet and needed two way communication with ATC and a transponder code before reaching the border. I waited for dead air time. And waited. The controller was barking out a continuous stream of commands to multiple aircraft in such a fluid manner that I wondered how he had time to think and plan before issuing each directive. It was amazing to hear, but frustrating to be excluded from participation by simple frequency congestion. "Cessna ABC contact tower 120.5; Northwest 123 turn left heading 180, vector for traffic; Experimental XYZ, proceed inbound, expect runway 23; Cessna DEF, request denied, remain clear Buffalo class Charlie; Cherokee GHI begin your procedure turn; Warrior 21481, stand by, remain clear Buffalo class Charlie; Experimental TUV, how will this approach terminate?" I finally had my foot in the door (better than in my mouth, which is more often the case). The flow of commands issuing from that darkened radar room somewhere below continued unabated. The border was a mere 10 miles, or five minutes, away. I began to coax the Warrior's nose northward to buy some extra time for the controller to get back to us. Five miles from the border we heard, "Warrior 21481, go ahead." I gave my spiel and was rewarded with a beacon code of 0430 which I hastily dialed into the transponder a couple of minutes before soaring over Niagara Falls and through the intangible boundary demarking United States and Canadian airspaces. In the back seat, my daughter slept soundly, lulled by warmth of the afternoon sun and the gentle vibrations of the Lycoming O-320 on the nose. There was absolutely no need for her to worry about such ridiculous adult things as border crossings and transponder codes. For their part, the adults relaxed a bit too and settled into a comfortable cruise through sunny Canadian skies. From 6500 feet over the Niagara River, the skyline of Toronto was clearly visible. While we were too high to discern building shapes, the large white dot appearing on the shoreline of Lake Ontario was undeniably the Skydome. The transponder code assigned by the harried Buffalo controller had a short shelf life, lasting just long enough to get us across the border. Not quite to the Welland Canal (connecting Lakes Erie and Ontario), we were told, "Warrior 481, you are leaving my airspace. Squawk VFR and contact Toronto Approach on 133.4 for continued advisories." We did and, once established on a new beacon code, resumed sightseeing. 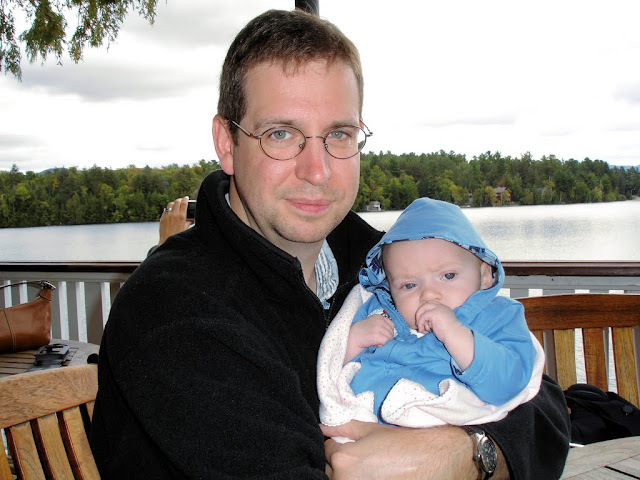 The trip across Ontario was unremarkable except that our daughter received her first meal at 8500 feet, an altitude that took us high enough to clear clouds and choppy air that materialized just west of Hamilton, ON. 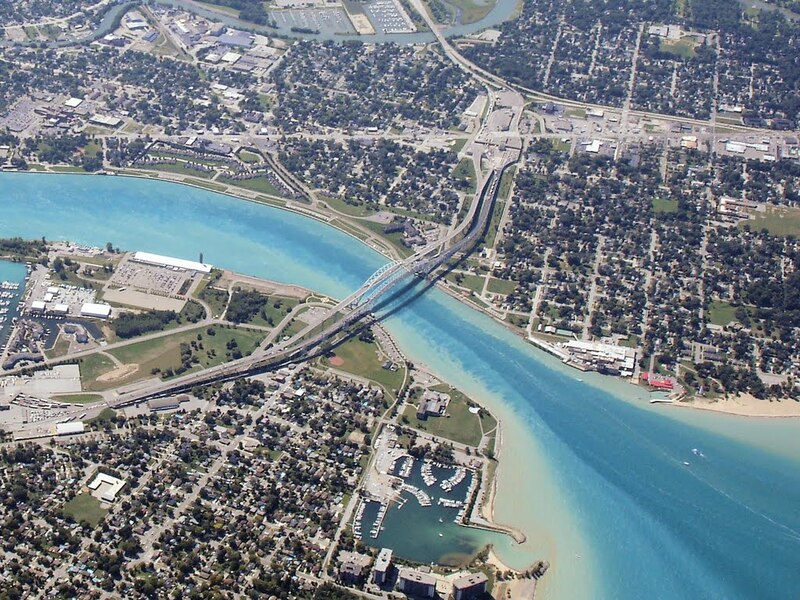 And then the St Clair River came into view. As the Sarnia airport slipped under the Warrior's nose, Toronto Center remained oddly quiet. "Warrior 481 is five miles east of Sarnia, should we contact Selfridge for the border crossing?" Toronto Center amicably agreed that we should do exactly that and so our daughter's first visit to Michigan occurred under the watchful electronic eye of the United States Air National Guard. 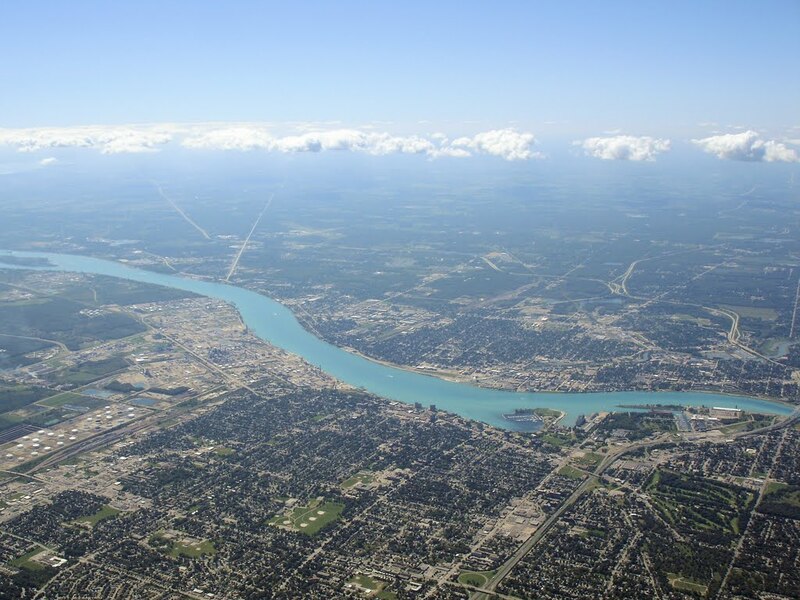 In order to avoid an excessive descent rate, we began to let down for Lapeer just west of Port Huron, MI. 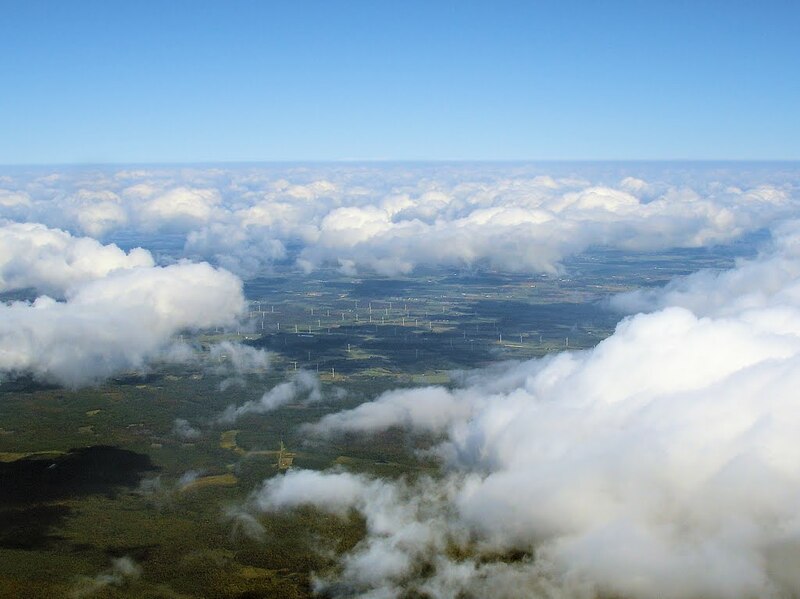 As we passed through a scattered cloud layer at 6000 feet, we terminated radar advisories from Selfridge and tuned to Lapeer's Unicom frequency. this point, in spite of efforts of customs agents from both nations. I visited Lapeer twice in the past. Both times, I experienced an unexpected downdraft at the approach end of runway 36 that terminated in an embarrassing plunk of a landing. Of course, both times this occurred with passengers aboard. 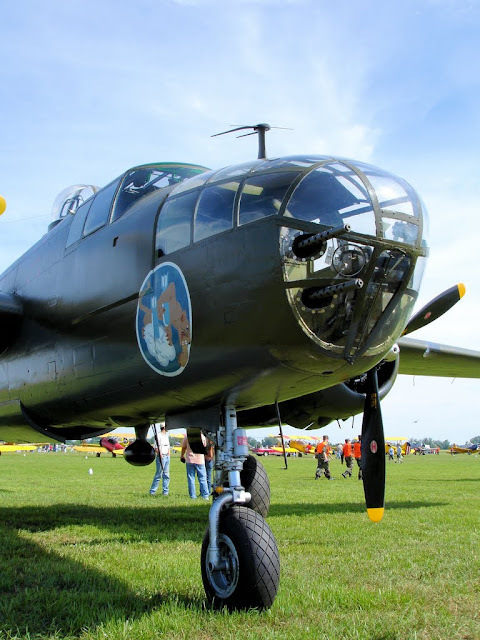 This time, with the left wing down to compensate for a light crosswind, the Warrior's wheels squeaked onto the pavement. Something about having my daughter on board seemed to make a difference - I have yet to make a crummy landing with her tucked away in the back seat. With The Bear fed and changed, she was ready to meet some of her family for the first time. Grandma Linda was the first arrival to the airport and joyfully renewed acquaintance with her granddaughter. Uncle Ron and Aunt Barb arrived shortly thereafter with Uncle Brian and Aunt Karen following on their new motorcycle. Uncle Brian recently decided to become a "biker", so when the two of them roared up to the airport, they were garbed in appropriate leather attire. "She packed my bags, nine a.m., preflight, and I'm gonna be high as a kite..."
The Aunts and Uncles smiled at the two month old aviatrix, who held up her end of the bargain by smiling right back. I inspected Uncle Brian's new bike and he inspected my Piper. A spirited discussion ensued regarding the best place to change a baby's diaper at the airport, with a picnic table just outside the terminal door winning. 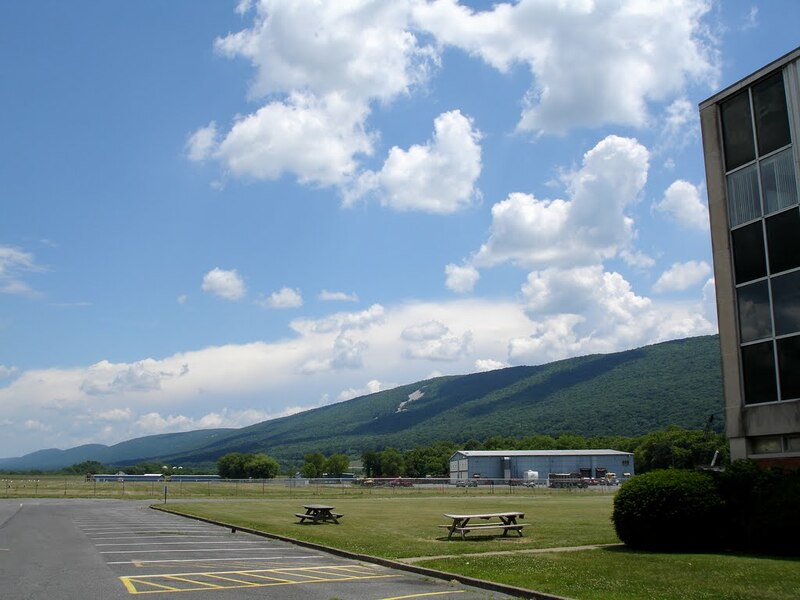 Meanwhile, students, instructors, and other aviators passed through the terminal building, favoring us with amiable, but confused expressions that clearly said "where did all these strange people come from and what are they doing at our quiet little airport?" With evening approaching, we were airborne again at 4500 feet, passing through Flint's airspace on the way to Kalamazoo. Despite the evening sun shining into our faces, the flight was a comfortable and familiar one. Flint handed us off to Lansing. In turn, Lansing handed us off to Kalamazoo. Before calling Kalamazoo, I tuned to the Kalamazoo ATIS to catch the current conditions and it was here that I discovered that Flight Service had failed me. I had not received any NOTAMS for Kalamazoo, yet the ATIS contained a litany of runway and taxiway closures that were broadcast with such rapid fire enthusiasm that, even after listening to the broadcast four times, I could not get past "runway 9-27 closed, taxiway bravo closed south of runway 9-27..." I looked back at Kristy, who gave me a "I didn't get any of that either" shrug. I called Kalamazoo approach and hoped the tower would not be too busy to provide progressive taxi instructions when the time came. From just north of Battle Creek, the Kalamazoo airport is not always easy to spot and the trick is to interpolate its position between Austin Lake to the south and downtown Kalamazoo to the north. With these landmarks in sight, I was able to point the nose in the correct direction when instructed to enter the pattern on a right base for runway 35. In the pattern, I spared a moment to peek at my former office while turning final, but was too busy to bask in nostalgia of any kind. There would be time for that on the ground. Kristy was busy with her own landing checklist as she returned The Bear to the five point harness of her car seat. It was another greaser landing on runway 35 at Kalamazoo. The place was uncharacteristically dead and the tower controller cheerfully helped us navigate the morass of closed runways and taxiways. Warrior N21481 tied down at Duncan Aviation with the Kalamazoo tower in the background. Inside Duncan's lobby, we waited a little while for the rental car. Our daughter spent her time grinning at everyone who looked at her and I was both proud and relieved at how well she was traveling. This feeling was to be short-lived. The rental car was a relatively new Ford Fusion that smelled of cigarette smoke. 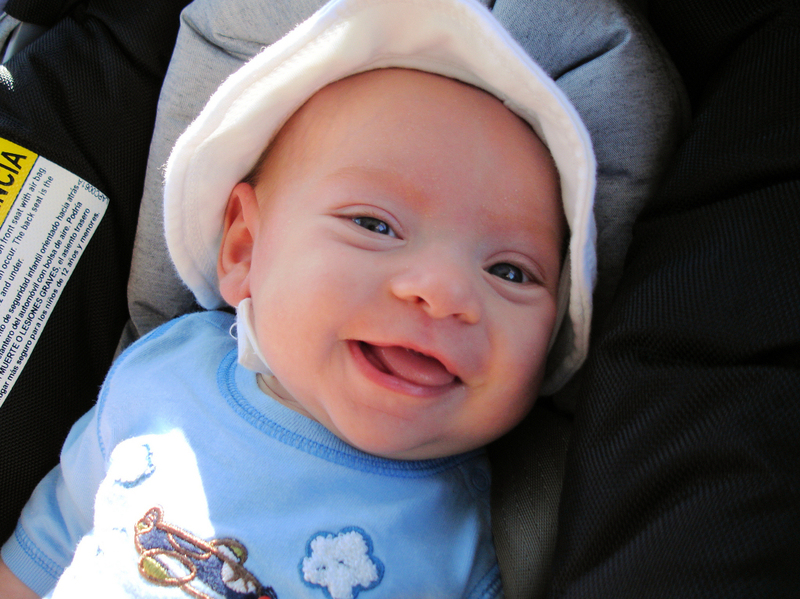 The moment we placed our grinning infant daughter into this car, she began to shriek. The screaming continued as we drove north on Portage Road, through a section of Kalamazoo once described to me on a 1999 interview trip as "a little seedy", and into the parking garage at the Radisson hotel. Once out of the car, the screaming stopped. Either my little girl had some fundamental issue with Ford or she found the cigarette smell as unpleasant as we did. Either way, she did not hesitate to loudly share her opinion. Frankly, we were happy that she did not have the same opinion of the airplane. The plan for the night was to meet our buddy Cap'n Dave at Chinn Chinn, a reincarnation of a Chinese restaurant that had been a lunchtime favorite during my time in Kalamazoo. Back in the Fusion, the screaming began anew. Driving in the dark along the Red Arrow highway, a curious spluttering sound announced the coming of projectile vomit. Our daughter was soaked, her Graco car seat was soaked, and she had even managed to hit the seat of the Fusion. To put it mildly, it was a rough night. Dinner was fantastic and we enjoyed Cap'n Dave's company. But our daughter was fussy for the remainder of the evening and we had quite a mess to clean up when we returned to the hotel. Despite the vomit, she showed no other indication of illness and the symptoms did not recur. Because we were on the ground for nearly 45 minutes before The Bear showed her displeasure in the rental car, we do not believe that her distress was related to the flight, but we'll probably never know for certain. The next day was spent visiting with old friends. The Bear got to meet a plethora of chemists, actors, aviation enthusiasts, and teachers. 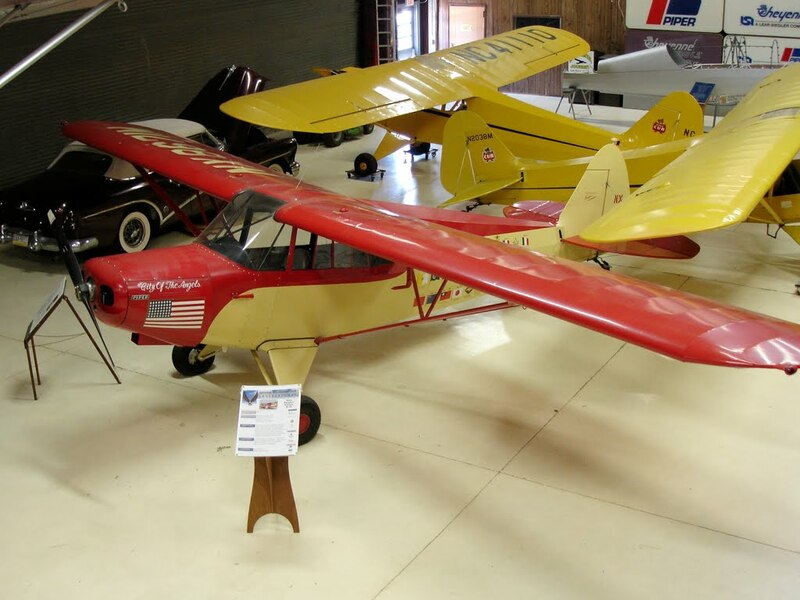 During the last 3.5 years we lived in Kalamazoo, I had been a fixture at the Air Zoo on Saturday mornings, giving tours of the museum's excellent collection of aircraft. So it was fitting that we returned to the Air Zoo that Saturday morning for a visit. 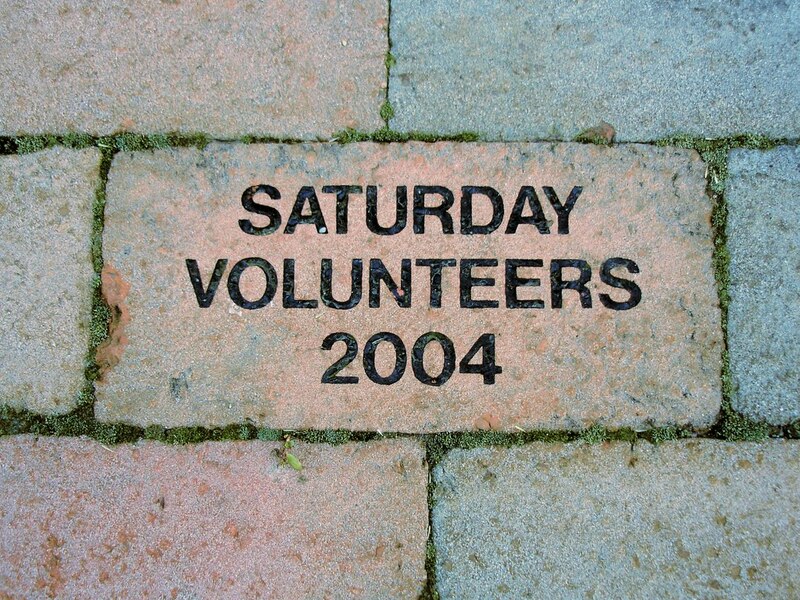 We started by searching the patio in front of the Air Zoo for the brick that my fellow Saturday morning volunteers and I had purchased as part of a fundraiser. Inside, The Bear and I crashed Dar's tour, already in progress when we arrived. Dar is a consummate storyteller and I could not help but grin foolishly when he finally noticed us and was thrown completely off his game in surprise. Before leaving, we took a mandatory portrait in front of the museum's most well-known totem, Sue Parrish's pink P-40 Warhawk. 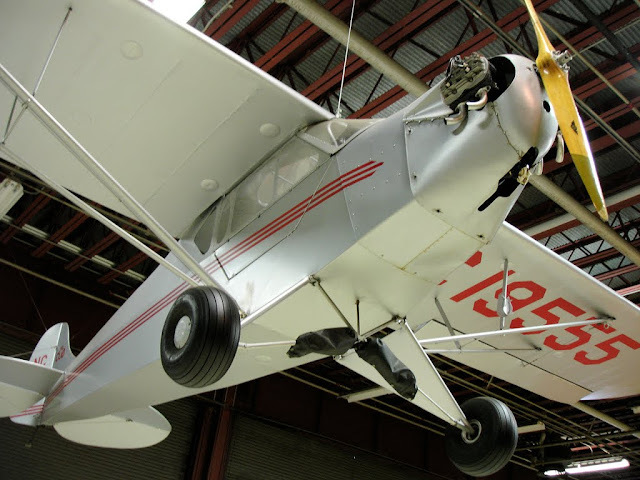 It was the airplane that always caught the attention of little girls on my tours at the Air Zoo. At one point, we drove past my former office. Across the street, the former world headquarters of the Upjohn Company lay in ruin, the foundation overflowing with the superstructure it once supported. I had not worked in that building often, but was nonetheless saddened by the tangible end of an era that its demolition symbolized. We had Mexican for lunch with Larry, Kent, and Simpson. Later that day, The Bear had a catastrophic diaper failure at Pete and Marcy's house (if related to the Mexican food, it was only indirectly so). And we got a glimpse of the future by visiting Matt and Andrea with their two young children. For dinner that night, we met Chris (a college roommate) at the new and improved Food Dance restaurant. It was our first visit to the new location a couple blocks east of the previous site. I had first eaten at Food Dance in the winter of 1999 on my interview trip to Kalamazoo and it had been one of my favorites ever since. Though much larger than the original cafe, the new restaurant maintained the fanciful decor (yes, including the giant asparagus) and excellent menu that we had come to expect. The Bear's dinner of milk also met her expectations, though it was not provided by the restaurant. Cap'n Dave met us for breakfast Sunday morning. By midmorning, we had checked out of the Radisson, returned our stinky Fusion, and loaded the airplane for the flight home. With The Bear strapped in and all baggage stowed, I started the engine and contacted Kalamazoo clearance delivery. 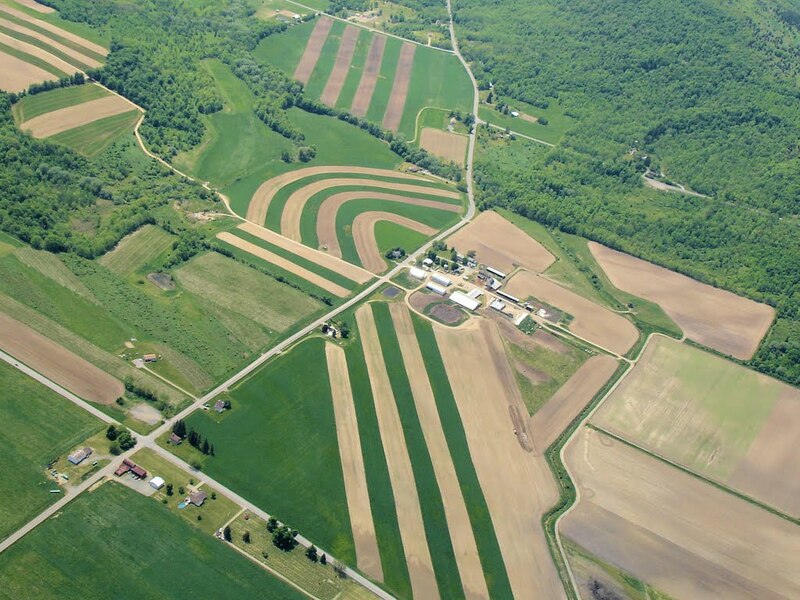 Our plan was to visit the Three Rivers airport where I did my flight training, check out this year's corn maze at Carpenter's Dairy Farm, and drop into our old home base of South Haven. From there, we planned to set off for home. I was surprised when Kalamazoo clearance instructed me to squawk 1200 and remain on tower frequency for the flight to Three Rivers. It was my first time ever flying in Kalamazoo airspace on anything other than a discrete beacon code. 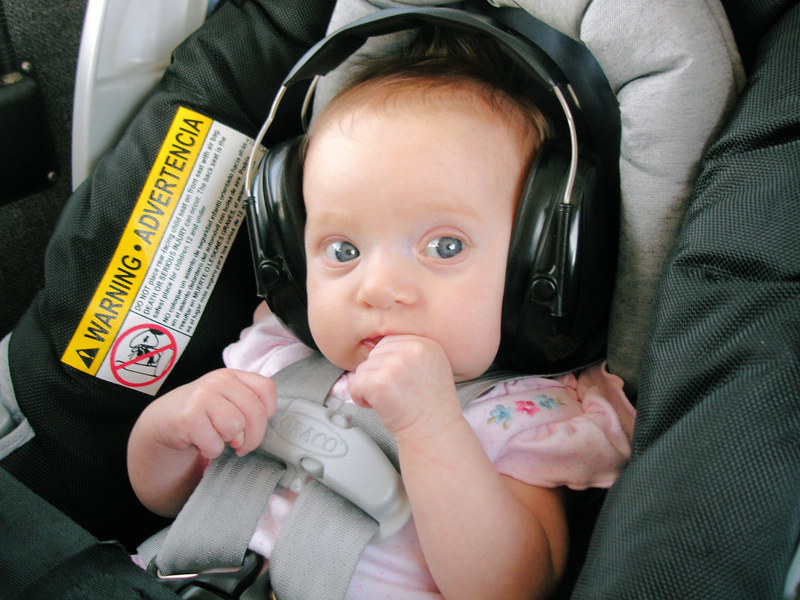 As we taxied slowly to runway 17, our daughter made the cranky sound she always makes in the car at stoplights; the one that means "hey, let's get moving". True to form, she was placated once we reached flying speed and pitched skyward. Climbing away from the airport, we could see the full extent of the demolition activity on the old Upjohn world headquarters. The sight was even more depressing from the air. Since we moved away from southwest Michigan, the city of Three Rivers had switched from pricey full service fueling to self-service. 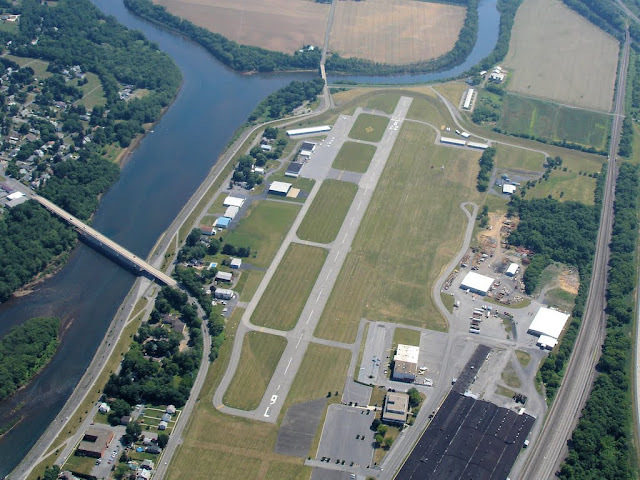 The concomitant drop in fuel cost made Three Rivers quite competitive with other airports in the area for the first time since I had started flying. 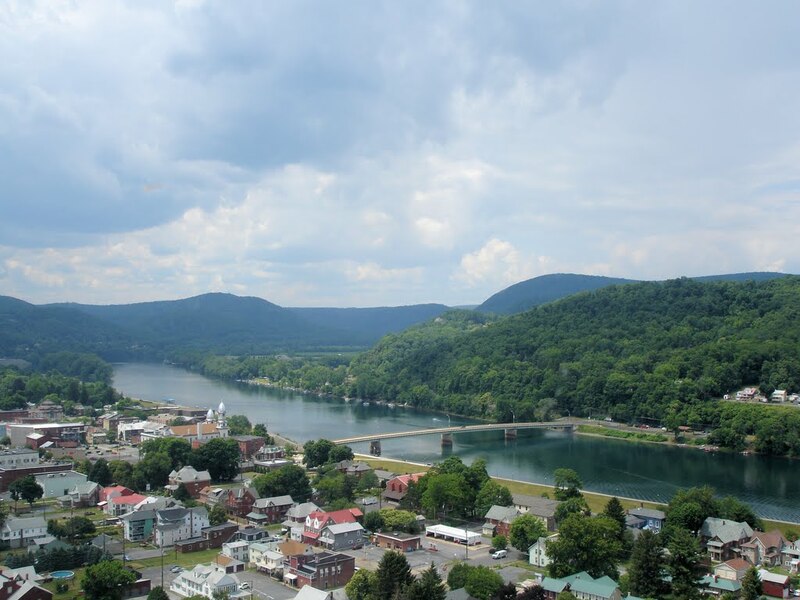 As I stood on the Three Rivers ramp fueling the Warrior, it was difficult to shake the sense that I was breaking the rules, like pumping my own gas in New Jersey. We wandered into the terminal building and found that some renovations and improvements had been made. Overall, it felt like a much more open and friendly place than it had before. After talking with Robin and Mark from Destination Flight, it was obvious that that was the intent. Though we had not met before, both of them recognized us from this website, a result of them having Googled their own airport and finding my accounts of training there. Not exactly fifteen minutes of fame for me, but perhaps fifteen seconds. 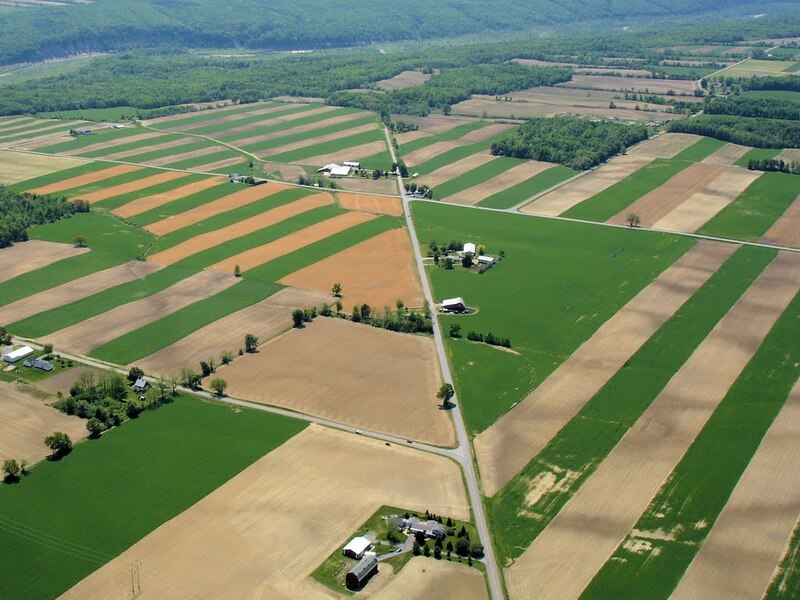 We departed Three Rivers bound for Carpenter's Dairy Farm in Bangor, MI. To our utter disappointment, there was no corn maze this year. 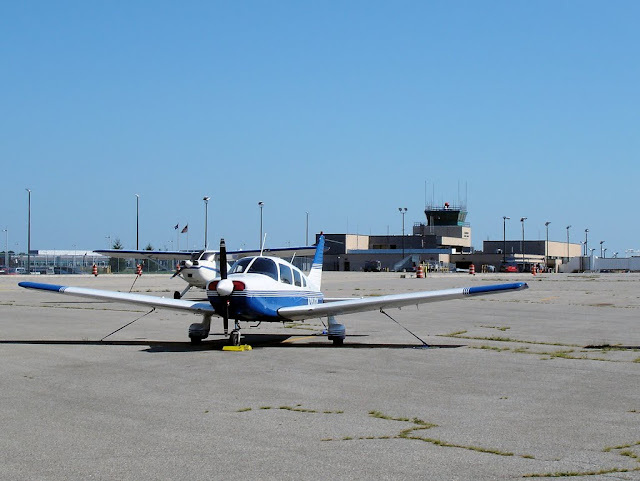 But with the South Haven Airport about five miles away, we landed there for a visit. None of the old gang was present, though there was an airport bum lounging in the terminal with whom I had some vague acquaintance. He shared some of the latest airport gossip involving some of my friends, but then pursued an awkward line of questioning with Kristy on the specifics of The Bear's feeding. Deciding that we had spent enough time at South Haven, we checked weather and NOTAMs and hastened back to the Warrior for the journey east. We landed at the Athelone Williams Memorial Airport in Davison, MI, just on the eastern edge of Flint's Charlie airspace. On my my first visit there, I wrote the Simpsonesque comment "saddest little airport ever" in my logbook. It was little more than a narrow asphalt runway surrounded by trees on all sides save for a tie down area. There was no structure of any kind on the field, only an electrical box to power the runway lights. But it was very close to the home of Jason, my college roommate and close friend to both of us during our undergraduate years. He was available and came right over to the field. While we waited, I contacted Flight Service and filed a flight plan for the ride back home across Ontario. At this point, The Bear must have decided that she had traveled enough. She was very fussy while we ate dinner in town and I think Jason was somewhat amused to see how busy our little aviatrix managed to keep us. But we had a great conversation with him and enjoyed a solid meal for the trip home. Climbing away from Davison, three distractions arose almost simultaneously. I was completely unable to raise Flight Service on the Flint RCO (remote communications outlet), despite being a mere ten miles from the Flint VOR. 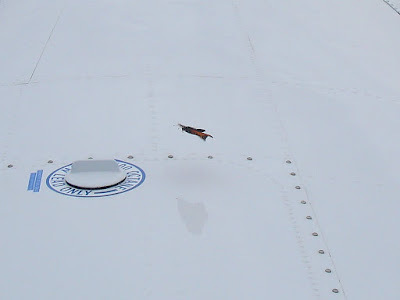 After behaving normally on run-up and during take off, the Warrior's tachometer abruptly stopped working and pegged to zero. And The Bear became very fussy. Our daughter was easy - she was hungry and not happy about being strapped into the car seat for the departure from Davison. Once we had a few thousand feet under the wings, Kristy was able to take care of her needs. Wide-eyed and ready for the journey home. Managing the tachometer situation was less trivial. A required instrument for VFR flight (the "T" in the delightful mnemonic GOOSE A CAT describing the pantheon of required VFR equipment), it was supposed to be like the old American Express slogan: "don't leave home without it." But we weren't at home. 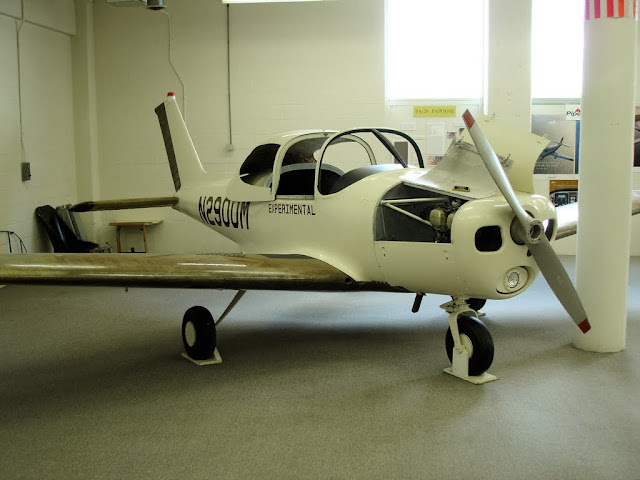 The failure occurred in the air over Michigan after departure from a facility so austere that it did not even boast a toilet on site, let alone a maintenance shop. There was no point in returning to Davison and I had no idea where else to go. Upon reaching 5500', I pulled the throttle back to the usual position where I get 75% power at that altitude, crosschecked it with airspeed, leaned by ear, and set course for home. It was not the most conservative decision that I could have made, but a dead tachometer was not realistically going to put the outcome of the flight at risk. I learned later that the failure was due to a worn fitting on the engine end of the tachometer cable; a simple repair. Through it all, I continued to broadcast, "Lansing Radio, Warrior 21481 on 122.3". As we flew eastbound, there was nothing but silence. Unfolding the sectional chart, I looked for the next closest RCO. We were flying through a portion of Michigan lacking a large number of navaids. The Peck VOR up in the thumb region and the Pontiac VOR well to the south were the next closest. I tried Peck first. "Lansing Radio, Warrior 21481 on 122.1, listening 114.0". Silence. This was distressing. We had not planned for the longer trip south of Lake Erie and could not fly across Canada without activation of our VFR flight plan. "Warrior 21481, Lansing Radio. Sorry, we're having problems with our receiver. Say request." Evidently, it was their radio with the problem, not ours. That was great, but my first priority was opening the flight plan so we could get home. "Warrior 21481 calling to open flight plan to Le Roy at 2200 Zulu." "Warrior 481, say again." I repeated the request. "Warrior 481, do you want us to open your flight plan?" "Affirmative." Was that some annoyance creeping into my tone? "Ok. Wh..." And that was the last we heard from Flight Service that night. 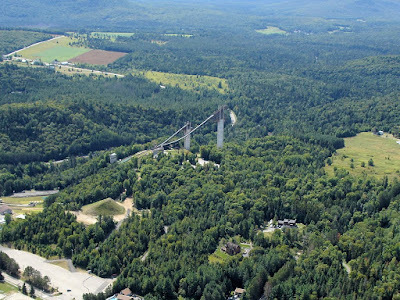 At this point, we were 10 miles from the Canadian border and I tuned to Selfridge Approach and made an initial call. "Warrior 481, ten miles west of Port Huron, 5500 feet, VFR to Le Roy New York, five golf zero." "Warrior 481, the radar at Selfridge is out of service. 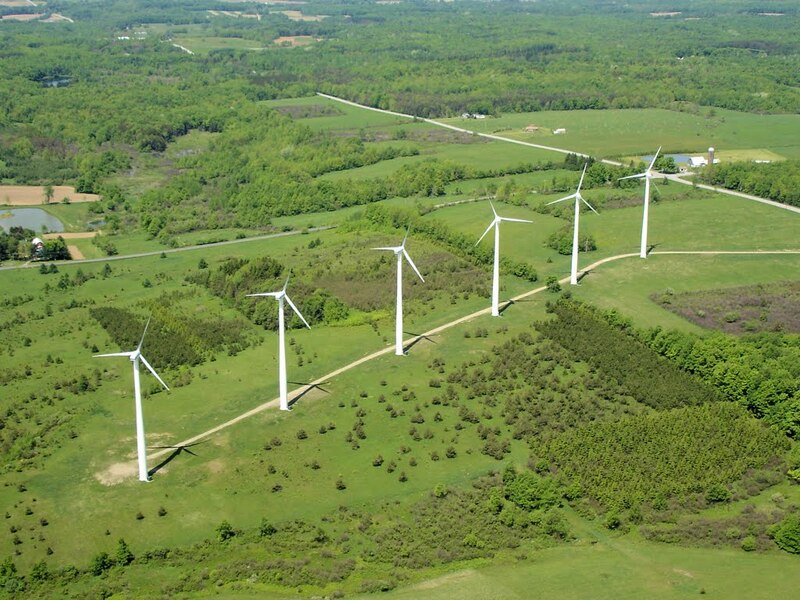 In another 20 miles, you should be able to reach Toronto Center on 135.3." I was stunned. Flight Service had been more than happy to tell me about lighting outages on towers that would pass thousands of feet below the Warrior's belly along our route of flight. Why did they fail to mention more pertinent information like a radar outage along the way? "Thanks, Warrior 481 will try to raise Toronto Center for the border crossing." And that, mercifully, worked. With the flight plan active, two way communication with Toronto Center established, and a Center-assigned squawk code dialed in, we were ready to cross the border. The Bear, now well fed, was back in her five point harness and grinning at Kristy as we crossed the St Clair River. To our surprise, she stayed awake for the entire ride back to Le Roy, the most wakeful we had ever seen her in a moving vehicle of any kind. 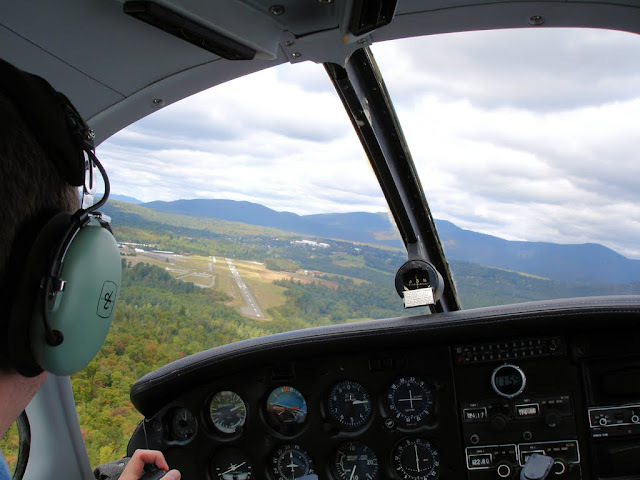 Our journey across Canada was boring, with the most excitement coming from the tongue lashing an IFR pilot received from Toronto Center for not repeating back his clearance. 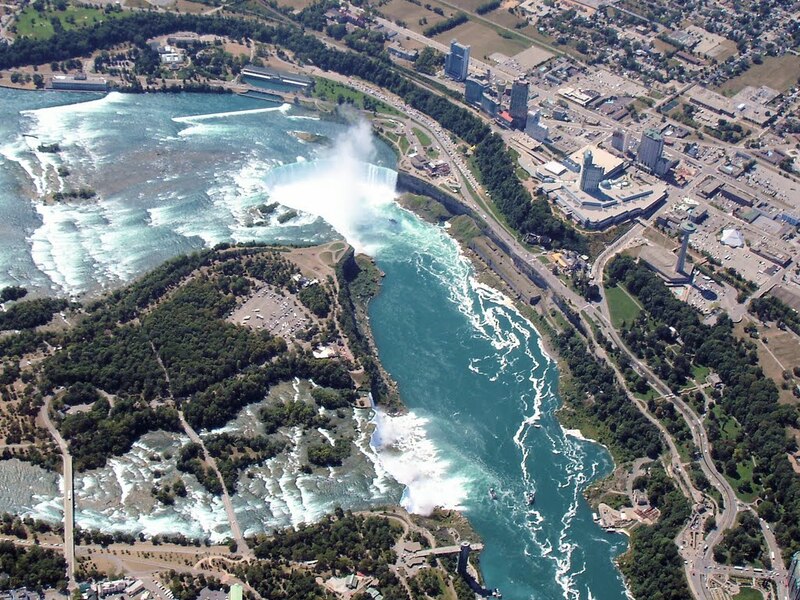 With Niagara Falls visible in the distance, Toronto Center handed us off to Buffalo Approach. As the sun began to set, we were transferred to Rochester approach and eventually cut loose from ATC altogether for the approach into Le Roy. The Bear holding hands with Mom somewhere over Ontario. Overall, traveling with an infant proved to be challenging. Perhaps the most valuable lesson we learned was in regard to backup clothing. Our approach was simple. We determined how much backup clothing The Bear goes through at home. Then we doubled it. We should have doubled it again. Obviously, the number of catastrophic messes an infant can make increases as a function of distance from home. Lesson learned. Perhaps most amazing is the impact that a snoozing twelve pound human being can have on a pilot's perspective and performance. Descent planning becomes more critical than ever and trivial problems are amplified in importance. Our daughter logged a total of 8.2 hours that weekend, flying 773 nautical miles as high as 8500 feet. For her, aviating was the easiest part of the trip. Throw in a lot of strange people and places and life became a little more overwhelming, though none of us would have guessed that a rental Ford would put her over the edge. But overall, she did not do too badly for a two month old. Not bad at all. I was craving another visit to the Adirondacks and finally found a cool day with high pressure dominating northeast New York. The high pressure meant minimal wind in the Adirondacks, perfect conditions for a mountain flying newbie to go exploring. Departing Le Roy at 9:30 am, I found myself in smooth air, though conditions were far from photogenic with a high overcast seeming to sap the landscape of all color. My destination was the Lake Placid airport. 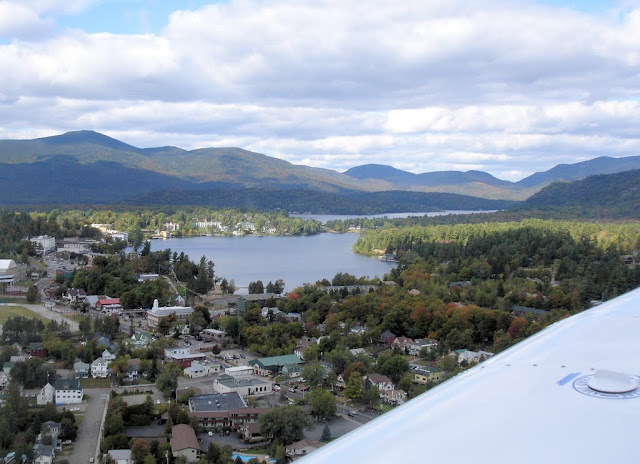 I had meant to land there in January 2007, but the 20+ knot direct crosswind conditions that day prompted a diversion to Adirondack Regional in Saranac Lake. Part way to Lake Placid, my Warrior and I emerged from under the overcast. 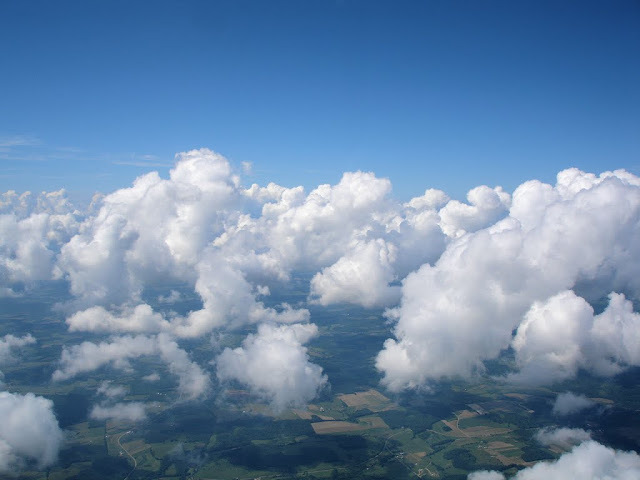 As I flew eastbound toward the mountains, my groundspeed converged with my true airspeed; the forecast for calm conditions actually came to pass. 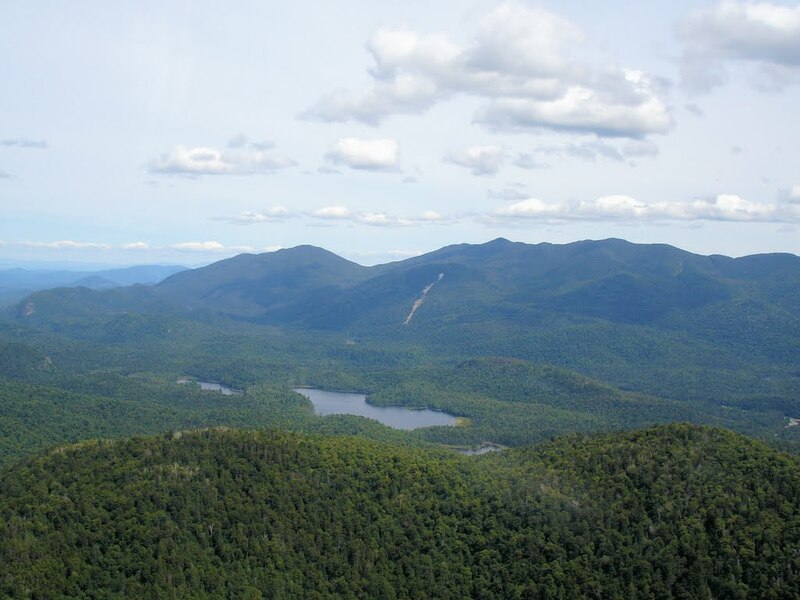 On approach into the Lake Placid area, Whiteface is unmistakably the dominant peak. 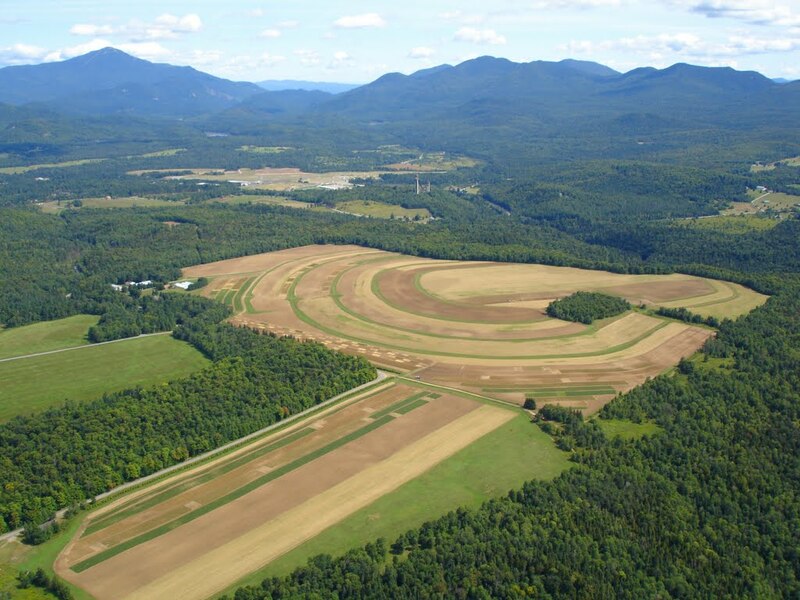 This large example of contour farming is just south of the Lake Placid airport. I first noticed it in satellite photos while flight planning and had assumed to it be a landfill. On the ground at Lake Placid, the FBO folks notified Lake Placid's free trolley service that there was a passenger at the airport. For lunch, they recommended "The Cottage" north of town. So I boarded the trolley and was whisked through town to my destination. I ate a terrific lunch outside, sitting on a patio overlooking the aptly named Mirror Lake. Afterward, I wandered around town playing tourist. Overall, it was a very relaxing afternoon spent exploring. Lake Placid, as seen upon departure from the airport. At 5000' above Lake Placid, the Warrior finally out-climbed the immediate terrain. Turning south, the overcast settled about 2000' above the highest peaks. Though ominous looking, there was no precipitation and the air remained glassy smooth. This photo was taken on the ground at Piseco Airport. I noticed this butterfly fluttering about during my preflight. It's not so much the profile view of this insect that caught my attention in this picture, but the classic butterfly outline reflected in the paint of my right wing. In the early days of aviation, the names of cities and towns would often appear painted on the roofs of large buildings or cut into nearby fields to aid pilots in their navigational awareness. Clearly, someone down there thought we should revive the practice, though it's a shame they did not make an effort to be more specific. Here's a sampling of photos from the Geneseo Air Show. 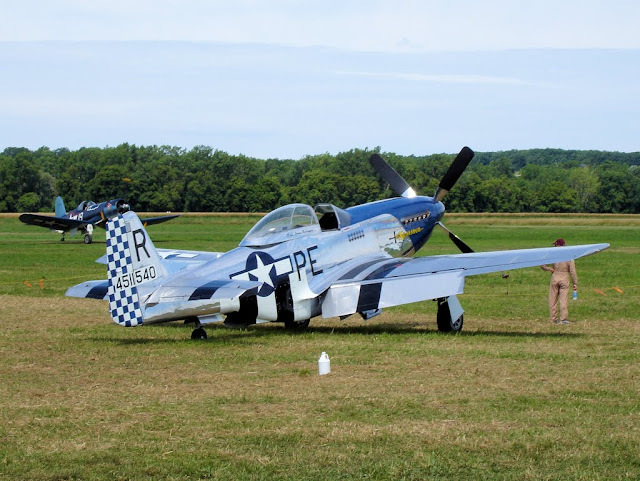 Just south of Rochester NY, an unassuming grass strip plays host to an excellent warbird show each summer. Kent and I attended on July 14, 2007. The 2007 show featured the B-17 that portrayed the "Memphis Belle" in the eponymous movie, a plethora of B-25s, and other examples of the finest aircraft of World War II. Up close to a movie star. The real Memphis Belle is under restoration. 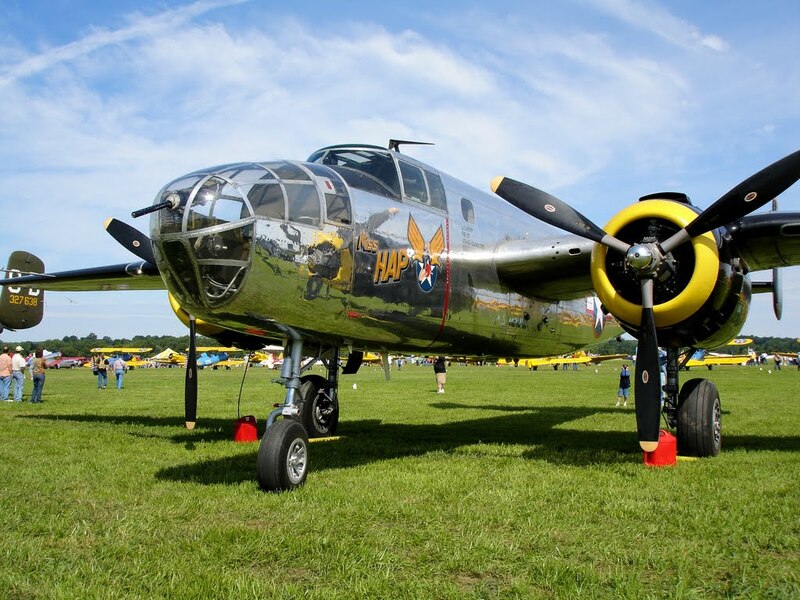 Hollywood's version is still airworthy and has been in the Rochester area since the 2006 Geneseo Airshow. 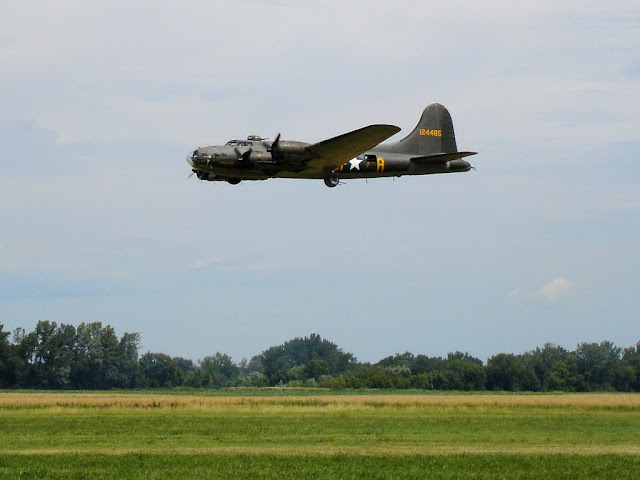 The "Hollywood Belle" makes a low pass over Geneseo. 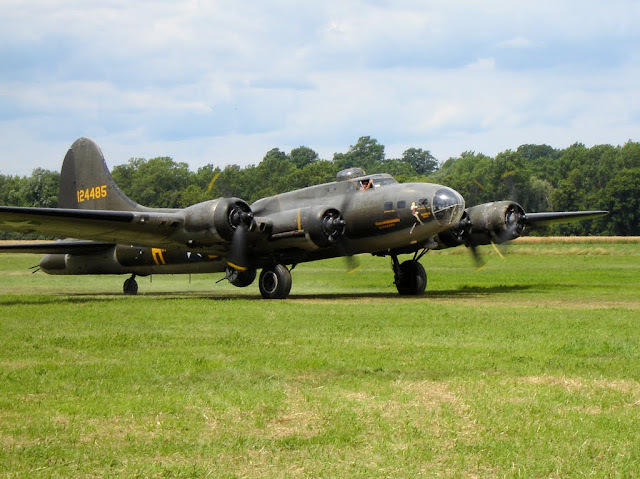 It was my first time seeing a B-17 Flying Fortress fly and, for that alone, the trip to Geneseo was worth it. 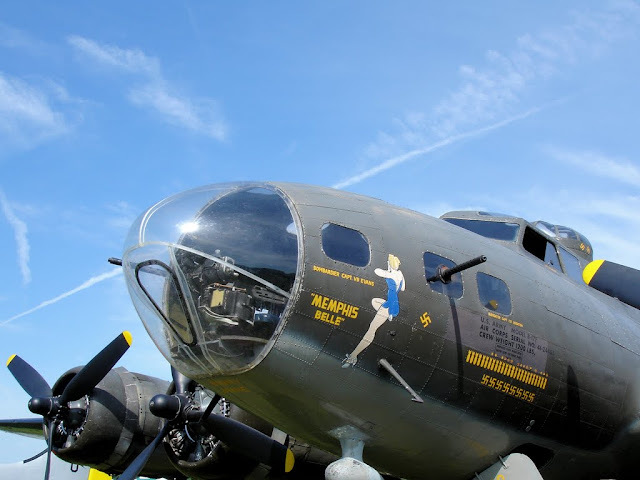 After several fly bys, the Memphis Belle landed on Geneseo's turf runway and taxied past. 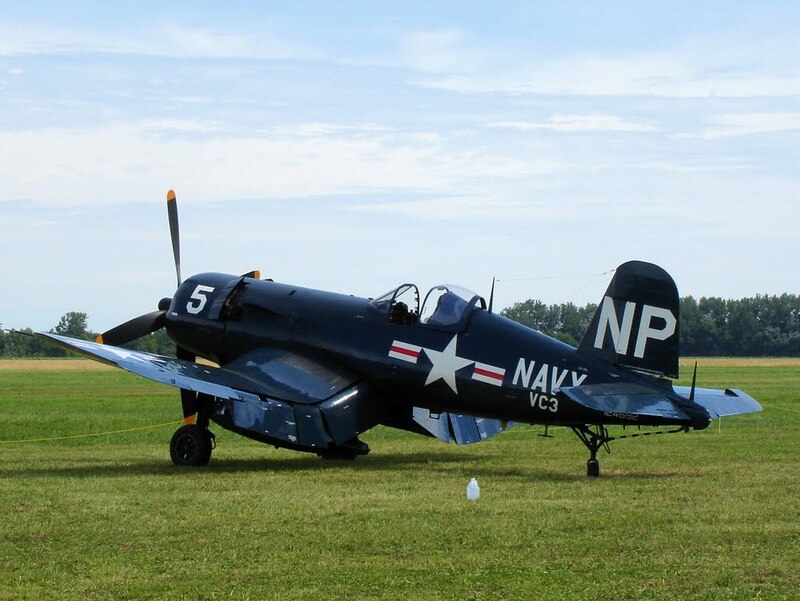 I always liked the look of the Corsair at rest with full flaps deployed, like a bird of prey with its feathers splayed. Nothing else has the classy lines of a Mustang. In World War II, this sharp looking twin served as a light cargo or VIP transport as well as an instrument and multiengine trainer. 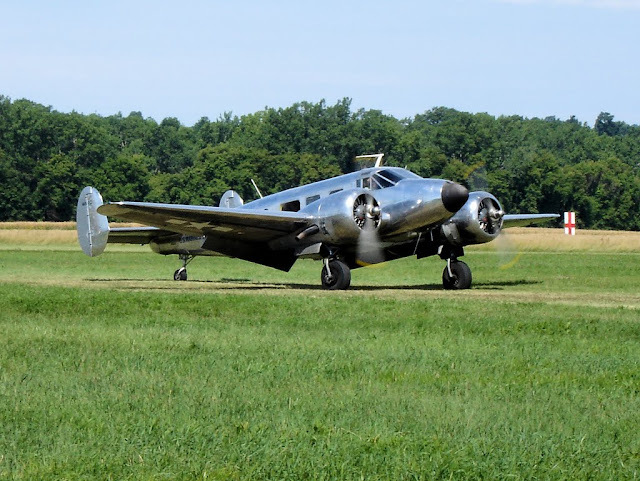 I believe that this C-45 Expeditor, the military version of the venerable Beech 18, is owned by the Historical Aircraft Group Museum on the field at Geneseo. 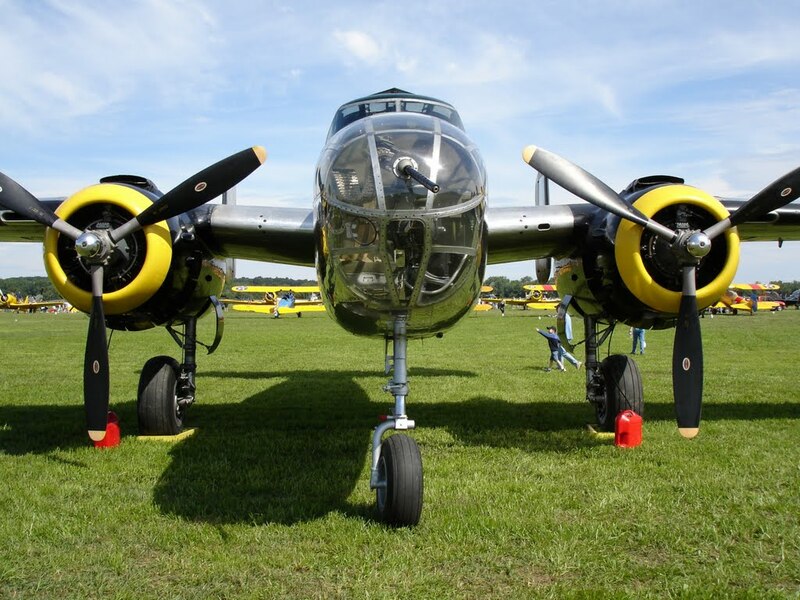 One of several B-25 Mitchell twin engined bombers on the field that day. 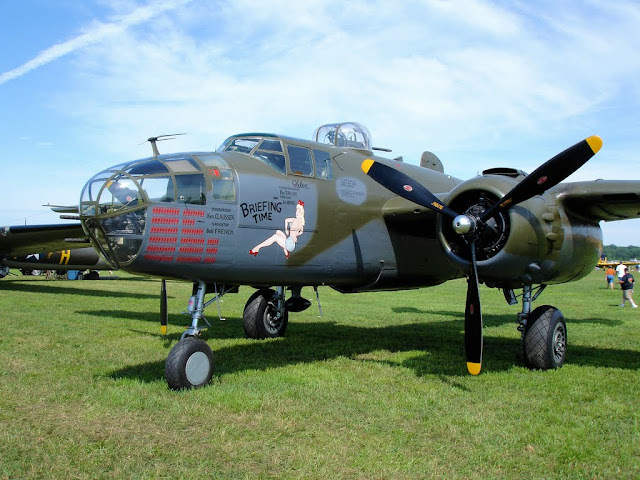 Another B-25, this one a prime example of "punny" nose art. Nose to nose with "Miss Hap". Oooo, shiny... This B-25 is based at the American Air Power Museum in Farmingdale, NY. Today was all about boring holes in the sky. No destination in mind. No training objective. Just flitting through the air over the Finger Lakes and taking pictures. 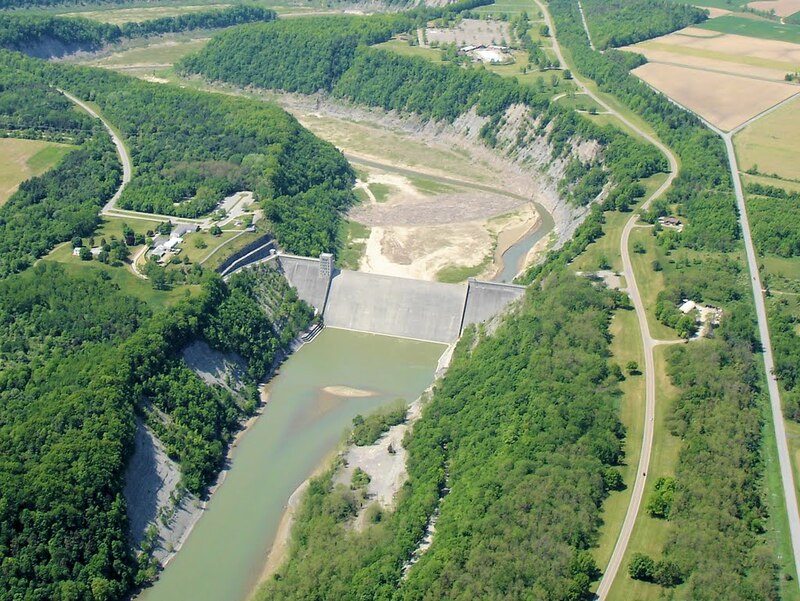 Traveling eastward, I crossed over the northern end of the always spectacular Letchworth State Park. The Mount Morris Dam controls the flow of the Genesee River downstream from Letchworth. As I flew over this portion of Letchworth, I was struck by the texture of the canyon walls accentuated by the position of the late morning sun. 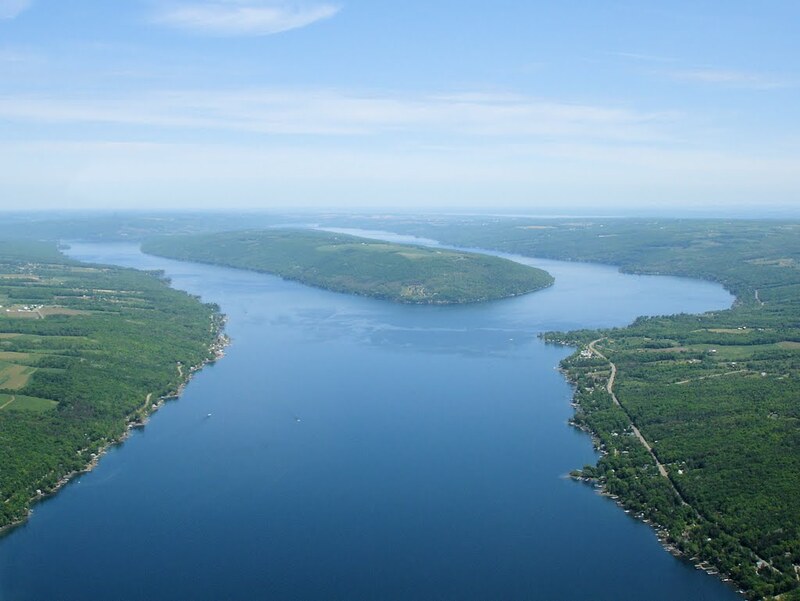 Further east, I crossed Keuka Lake. 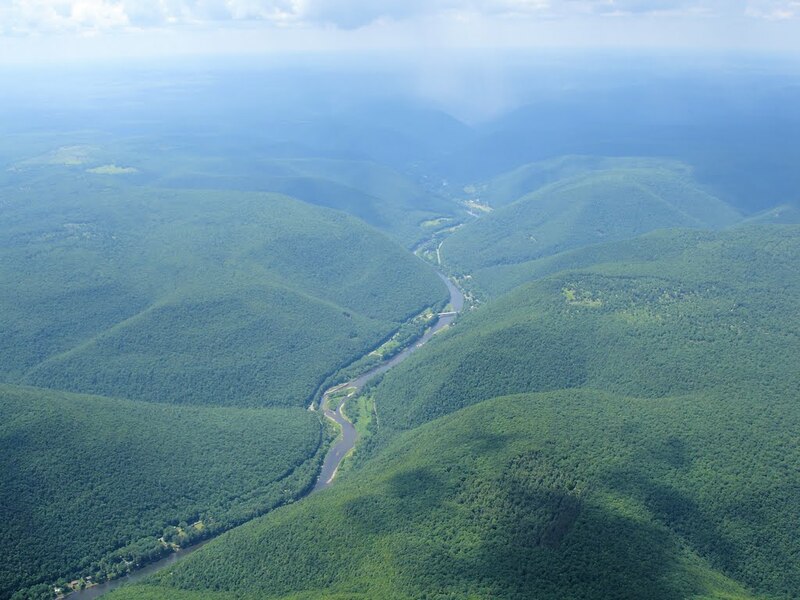 This is probably the most distinctive of the Finger Lakes because it is shaped like a "Y" (the landmass at center is not an island, it's a peninsula). Owing to the rolling terrain, strip and contour farming is quite common in western New York. 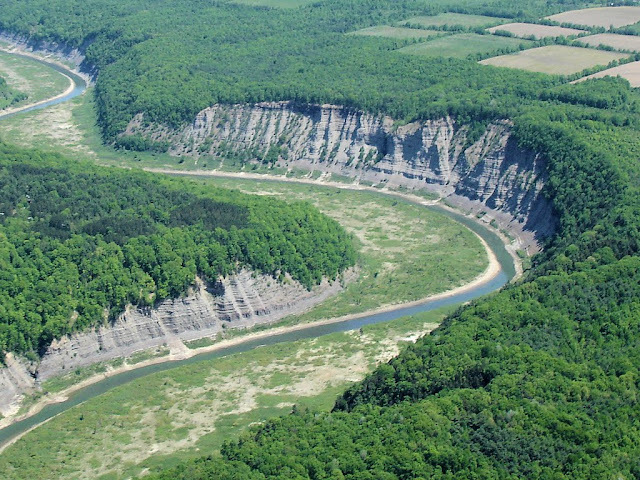 This example is just west of Letchworth State Park (the river gorge can be seen in the background). 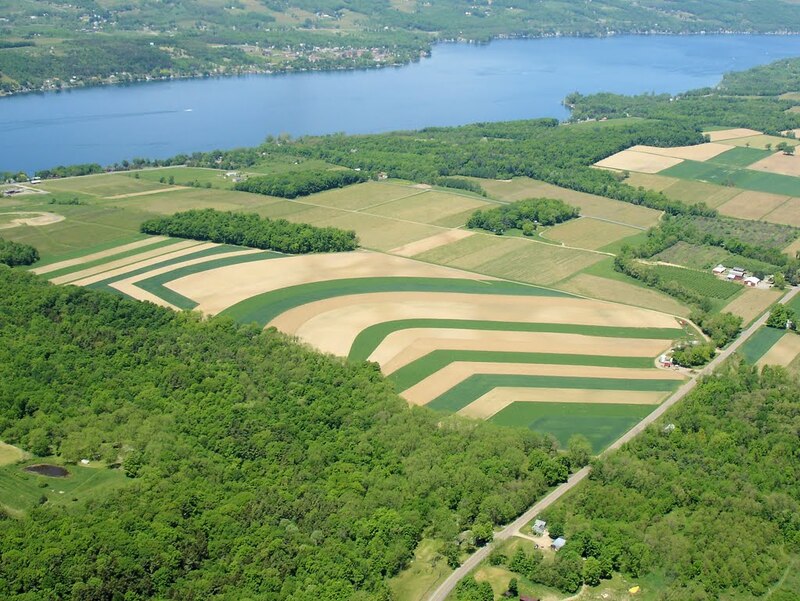 Another example, this one on the eastern shore of Keuka Lake. A last example, this one is on the northern end of Keuka Lake near the Penn Yan airport. As I found myself close to Penn Yan (PEO), I decided to drop in and explore. 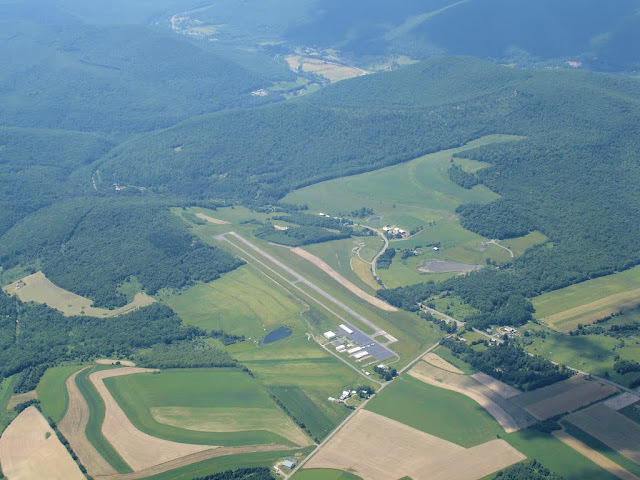 The winds were favoring runway 28, the shorter of the two runways at Penn Yan (which is still much longer than the runway at Le Roy). On short final, the sight picture looked wrong somehow. In the flare, the wheels lightly kissed the ground. Then the airplane was flying again. The wheels touched again, ever so gently. And then I was flying again. The third time, the airplane stayed put on the asphalt and I finally realized that runway 28 is on a significant downhill slope! 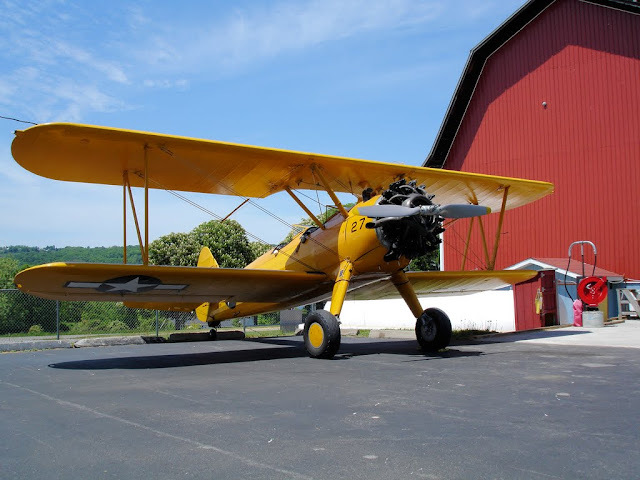 I could see this Stearman from across the airport. It called to me. So I wandered over and took a look. Great airplane, wonderful setting. 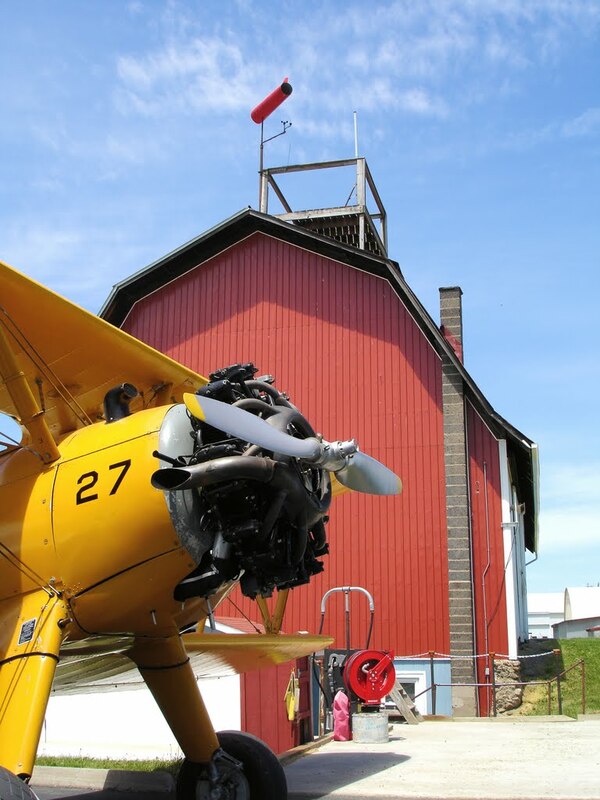 I loved the look of the barn next to the airplane. The entire tableau just seemed to fit. I particularly liked the makeshift "tower" platform up on the roof. I like airports with character and Penn Yan certainly had it.